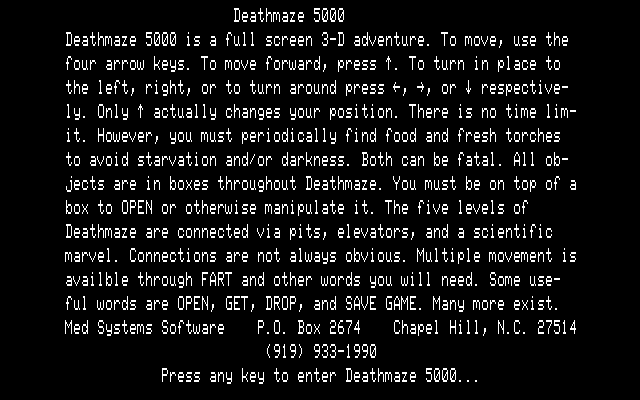 After asking me whether I want to load an old game or not, Deathmaze 5000 informs me about being a fullscreen 3D adventure and quickly explains the controls. Some of the commands are also explained and most of it is pretty straightforward...except: “Multiple movement is availble [sic!] through FART and other words you will need.” Come again? 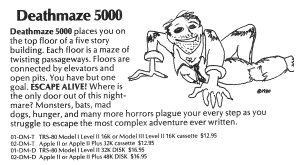 Oh well, we'll have to wait and see if this is just a juvenile joke or if it will make more sense inside the maze. 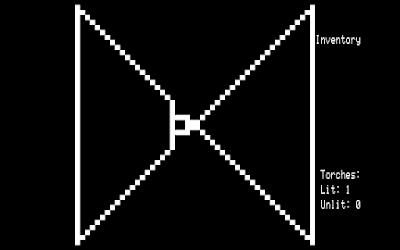 This time I bypass the invisible guillotine by taking another path and progressing into another long corridor on the western side of the maze (I assume). 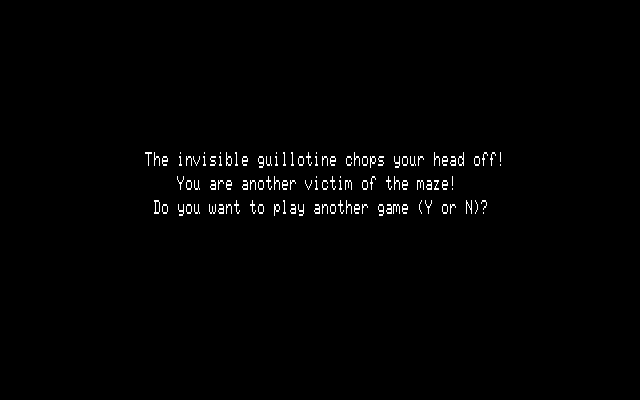 After five more steps another invisible guillotine chops my head off and it's back to the beginning – who would have thought this game to be so Robespierrian! Third time's the charm – I move in the opposite direction and discover a long corridor along the southern end of the maze. At the end of said corridor I retrace my steps on the map and deem it likely that it's a square made up of ten times ten rooms. 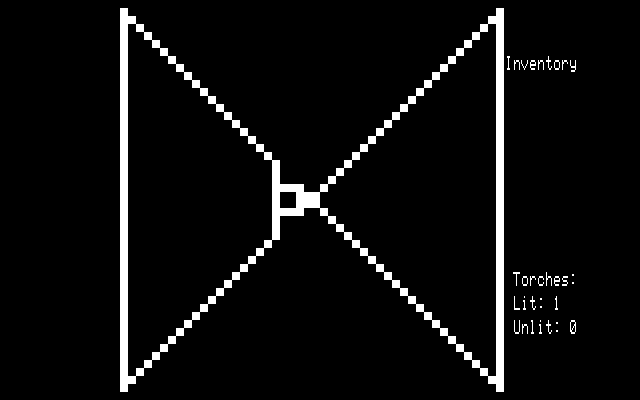 Around the next corner, I find a diamond ring inside a box and add it to my inventory with simple parser commands (“Open Box” - “Get Ring”). An examination of the ring in my inventory reveals nothing, though. I can wear it but cannot tell what good (or bad) that does me – it appears to be out of character, however, as the game tells me: “OK... if you really want to, you are wearing it.” Around another corner I find a crystal ball but once again a close inspection reveals nothing. I sure hope these treasures will come in handy soon. The third treasure I stumble across appears more useful: a jewel handled dagger. At least I'm not unarmed anymore. 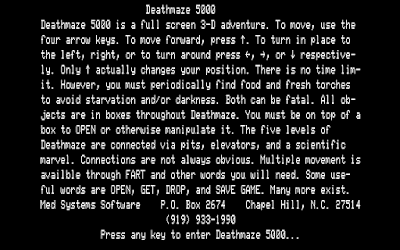 On we go through the strangely empty deathmaze, finding a “precision crafted frisbee” next. So far, it's an entertaining mapping exercise but not much else. And it's becoming stranger by the box – the next one contains a rotted mutilated sneaker: is there a dog somewhere around hiding his belongings in boxes? The sixth box is even more enigmatic as it only contains a message: “To everything there is a season.” Isn't that from the bible? The message seems to lock me in place, though, and after a few futile moves the words “TURN, TURN, TURN” appear next to the diabolic message. Finally, I die of starvation, but the words ring a bell. Rat's Revenge does not appear to be the only Med Systems game with 1960's music references – the message must be referencing the Byrds but I'm not really sure what that should tell me. I seem to have encountered my first puzzle but instead of finding a way to react to it I remain locked in place and die of starvation. At least this time my head wasn't chopped off. I resolve to map the remainder of the level before getting back to the devious flower power room. Following the western corridor up to the end I discover a way to avoid the invisible guillotine – and there seems to be only one of them, too. Seems I got lost on my second attempt. In the top left corner of the maze, there is a hat with two ram's horns. Examining the hat finally reveals something: I can use it to charge through a wall nearby. 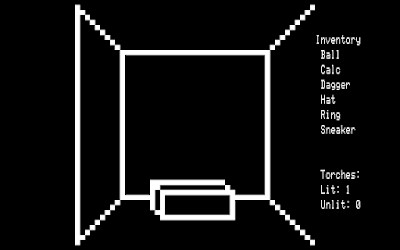 I follow the corridor until the end and according to my map it seems logical that there is one room left out just to the south – this must be where I can use the hat. I type “charge” and get the following message: “You have rammed your head into a steel wall and bashed your brains out! 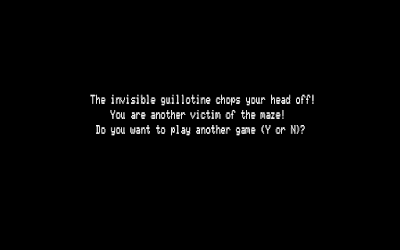 You are another victim of the maze!” Talk about insidious red herrings – I knew the game would be harsh but this is just cruel. Well, what did I expect, anyway. See that? It's the invisible guillotine, right ahead. 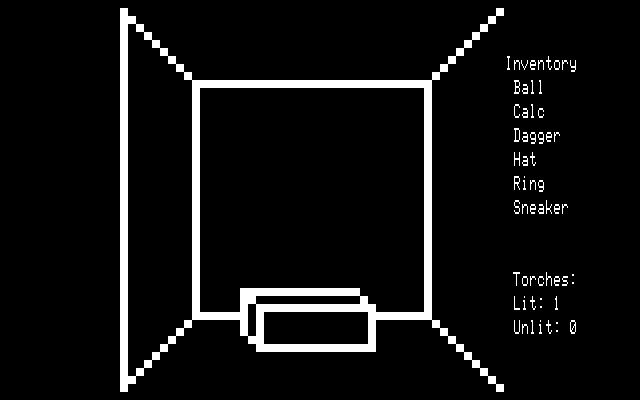 Another restart and this time I'm determined to solve the Byrds puzzle before finding the wall I can safely charge into. I've got a complete map of the maze now and two challenges I can really bang my head against (excuse the pun). I return to the room with the message and first discover that I can still open the box while being trapped there. The box reveals a calculator displaying the number 317. Could this be a code? An examination of the calculator reveals that its display is smudged so I type “clean calculator”, revealing the displayed number to be 317.2. Could this be the number of times I have to type “turn” to get out of this mess? Do I have to turn the calculator? Both doesn't work, unfortunately, as the parser doesn't know the verb “turn”. Do I have to turn myself? I try to turn left three times, then right one time, then left seven times, then right two times – nothing happens. When I start to turn right, once again nothing happens. Now this is where I am stuck for quite a lot of time – I even fetch an old calculator to type in the number in real life. In school we used to type in certain numbers and hand the calculator to other kids upside down – to convey messages or insult one another. The number 7 would work as the letter L upside down and so on – could this make sense? I turn the calculator upside down and get “2.LIE”. Well, it's an English word for starters but what does “2.LIE” mean? I try typing “2.LIE” into the parser but the result is as expected. This is a tough nut to crack. Could the “5000” have any meaning, though? I subtract 317.2 and get 4682.8 – nothing much to go on, either. I decide to restore and get back to the hat. Do I possibly need to charge my way out of this trap? The hat is located nowhere near the calculator room, though, so it seems unlikely. At least this riddle can be solved more easily. I do bash my brains out one more time by charging into the western wall from where I found the hat – however, the northern wall doesn't stand a chance against my charging skills and brute force opens the way down into a pit and then drops me off on level 2 of the maze. I am pretty sure that I will need that calculator at some point, though, so I'm probably already dead-ended if I don't solve that puzzle soon.